"After viewing the 2 together the only thing I noticed was that the thermal spring is installed in the opposite direction when compared to the C9ZE-B shown, but I do not think that it makes a difference. I believe the difference between the C9ZE-B and the DOZE-A is in the calibration of the thermal part for whatever reason." 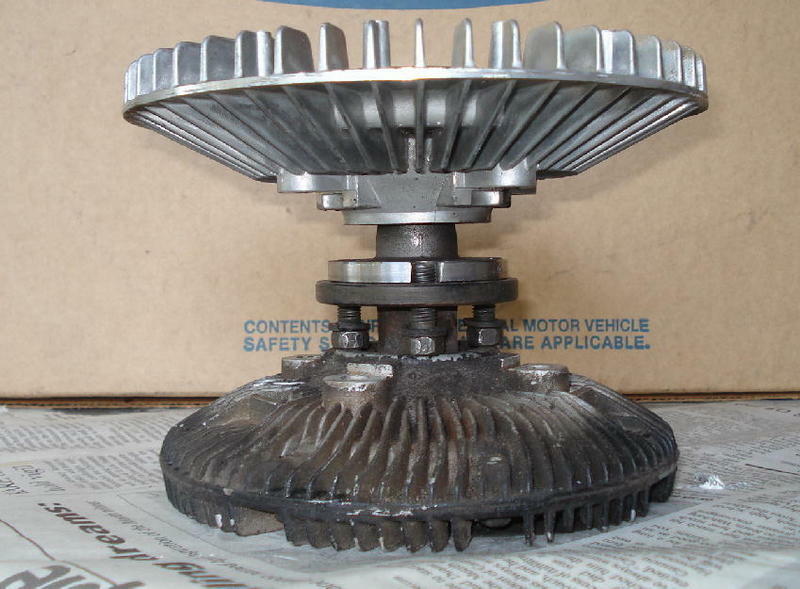 Loss of fluid and subsequent bearing damage is a frequent problem with these fan clutches as they age. Fortunately they can be professionally restored by a company named Pampered Corvettes; contact the company directly for details. 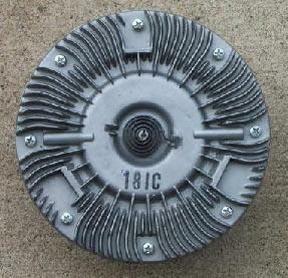 If you're looking for a replacement clutch and don't care about originality, Matt Kunkle reports that the Motorcraft replacement clutch for a 1971 Lincoln 460 (part number C8SZ-8A616-B, which may or may not be available from your local Ford dealer as of this writing) will fit and work just fine. Unfortunately, I've also heard that this clutch doesn't fit. 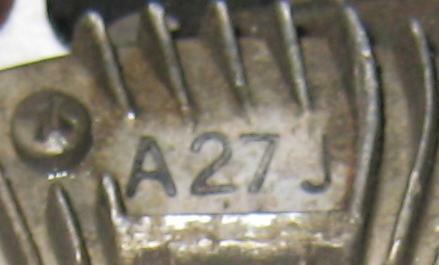 Notice the ink stamp (18IC, 123J above; A27J below) that's visible on some of the clutch pictures shown here. 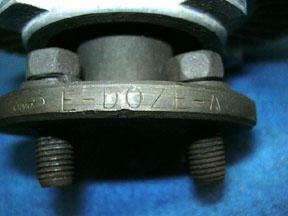 I'm not sure how to decode it, though at least part of the stamp appears to follow Ford's date code format. Image courtesy of Brandon Badell. I have received reports that say that certain aftermarket clutches made by Hayden (catalog available on their web site) will fit. 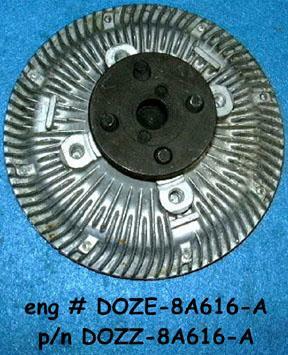 Part number 2765 (1.09" shaft, 3.25" bolt circle diameter, 7.20" diameter clutch body, 2.67" overall height) is supposed to fit with the C9ZE-E fan. 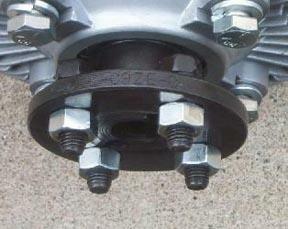 This clutch is available from NAPA under part number TEM 261306. 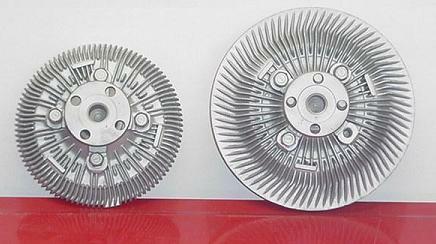 Part number 2711 (1.40" shaft, 3.00" bolt circle diameter, 7.20" diameter clutch body, 2.98" overall height) is supposed to fit with the C8OE-B fan. 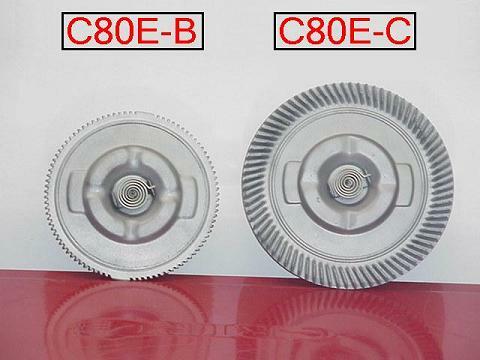 This clutch is available from NAPA under part number TEM 273370. 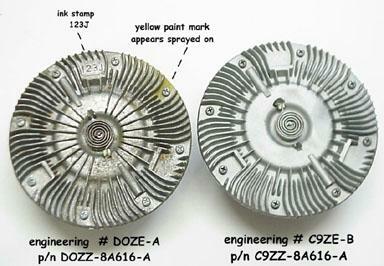 Here are two pictures (picture 1, picture 2), courtesy of Jim Woods, that show the 2765 clutch compared to the C9ZE-B clutch.